When most homes have so many iPod docks there's invariably one being used as a doorstop, it takes an awful lot of innovation to flog a new one to the masses. Will Sony's SRS-V500IP thermos-speaker-like dock work? Undoubtedly, no. While it's not actually a thermos sitting in the dock (I know, disappointing right? ), the design is equally as barmy—the cylindrical speaker can be removed from the dock and used in a drink tray in a car, while connected to an iPod. 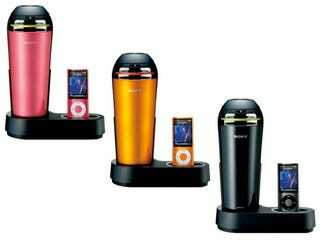 Otherwise, the little docking station is for more private use, with the speaker unit projecting audio in 360-degrees thanks to that cylinder-like design.